Home > Blog > History Blog > Happy 15th Anniversary, Acela Express! 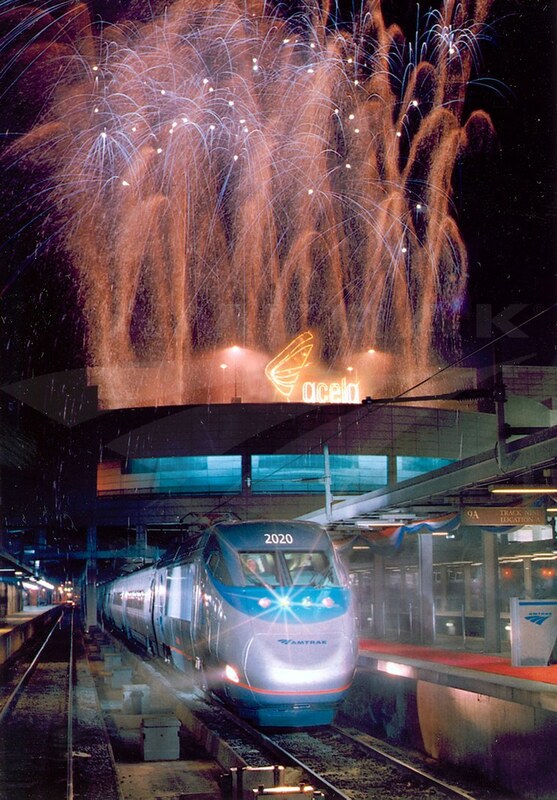 Fifteen years ago today, regularly scheduled Acela Express service began on the Northeast Corridor (NEC) between Washington, New York and Boston. From now through February, Amtrak will mark the anniversary with special “Acelabrations” for customers and employees. Surprises on the trains, in stations and elsewhere are planned as Amtrak pauses to celebrate this milestone. 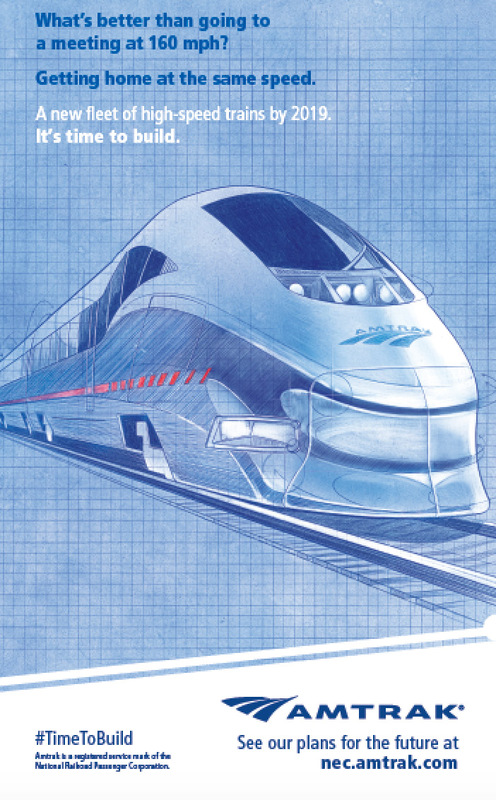 In a series of blog posts starting today and extending into February, we’ll take a look back at the journey to Acela Express and explore the service's future. following a special run for invited guests. Although Acela Express entered revenue service on December 11, 2000, the American public had received its first glimpse of modern high-speed rail a month earlier. Then-Amtrak President and CEO George Warrington, along with the Amtrak Board of Directors, welcomed aboard federal and elected officials and members of the media for a special preview trip on November 16. “Every generation is marked by breakthroughs. The launch of Acela Express is one of the defining moments of this generation. It puts passenger rail back in the big leagues as a first-rate competitor,”1 said then-Amtrak Board Chairman Gov. Tommy Thompson at the inaugural run. The sleek, aerodynamic trainset – one of 20 designed and built by a consortium of Bombardier and Alstom – included six passenger cars positioned between power cars at each end. The power cars have 6169 horsepower and are capable of reaching speeds of 150 mph over current NEC infrastructure. The passenger cars incorporate tilt technology, in which they can handle curves at higher speeds than conventional equipment by leaning into them. 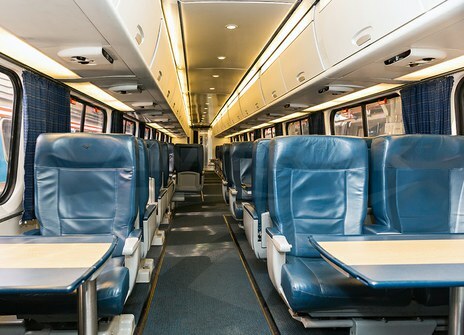 The Acela First Class car features spacious 1x2 seating. 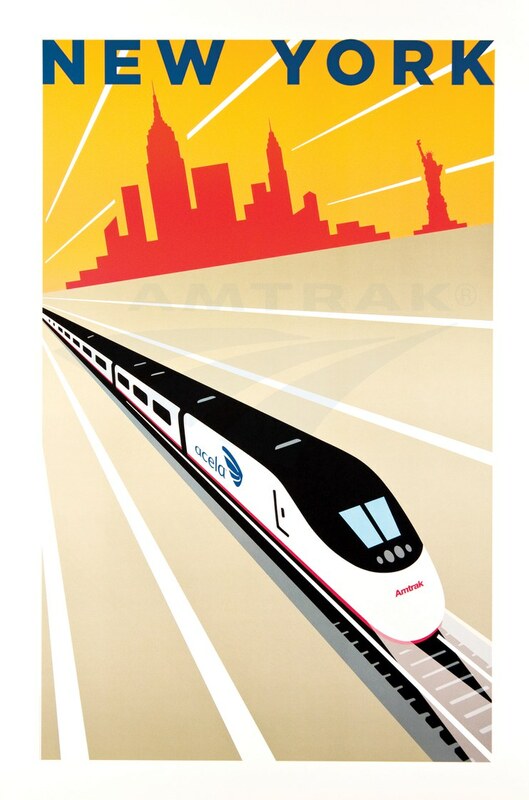 On October 18, 2000, Amtrak announced that regular Acela Express service would begin on December 11, with tickets available for sale on November 29.5 Initial service included one daily round-trip between Washington and Boston, with more frequencies added to the schedule as additional trainsets were delivered.6 “The new Acela was a great boost to the morale of all Amtrak employees, and it proved to be a star marketing tool for all Amtrak,” says Black. Ridership from December 2000 through the end of the fiscal year in September 2001 amounted to approximately 462,000 passengers. New frequencies and the benefit of extensive marketing helped grow ridership to about 2.5 million the next year. "The entire nation helped build Acela Express - it was visionary and aspirational transportation...It is the sparkling gem of a national passenger rail system." - John Robert Smith, former Amtrak Board Member. Amtrak is making investments that will position Acela Express service to meet the demands of growing ridership while also supporting the mobility and economic needs of the greater Northeast. In early 2016 the company will announce a contract to acquire the most technologically advanced high-speed trainsets ever to operate in North America for the next generation of Acela Express service. In addition to being faster and lighter, each trainset will have 40 percent more seats than those currently in use. There will also be 40 percent more trainsets, allowing Amtrak to increase the number of departures during peak hours. These new trainsets will provide a smoother ride and a host of other amenities that build upon the high quality of service that customers have come to expect. The first of the trainsets is expected to enter service in 2019. Going hand-in-hand with advancing the next generation of Acela Express is a need to improve the NEC infrastructure. The rail line is the busiest in North America; approximately 2,200 Amtrak, commuter and freight trains operate over parts of the NEC every day, carrying an average 750,000 commuter and Amtrak passengers every weekday. This intricate coordination takes place on infrastructure whose key components, such as the Hudson River Tunnels into New York City, the Portal Bridge over the Hackensack River in New Jersey and the Baltimore and Potomac Tunnels in Maryland, are more than a century old. The last opened only eight years after the Civil War concluded. Without significant investment to add tracks, eliminate chokepoints and upgrade electrical, communication and signal systems, the NEC will not be able to keep up with the Northeast’s expected growth. As the majority owner of this complex commuter and intercity rail network, Amtrak knows that its future depends on the investments made today. It’s critical that elected leaders, stakeholders and community members make infrastructure improvements a top priority. Learn more about investing in our infrastructure by visiting the Amtrak Northeast Corridor website. Did you ride Acela Express at the time of its launch? Share your memories with us in the comments section below! 1 “Now boarding: Acela Express,” Amtrak Ink, December 2000/January 2001. 3 Matthew L. Wald, “High-Speed Train Makes Flashy Debut,” The New York Times, November 17, 2000. 4 Laurence Arnold, “Acela Express Garners Raves,” ABC News, Nov 17, 2000. 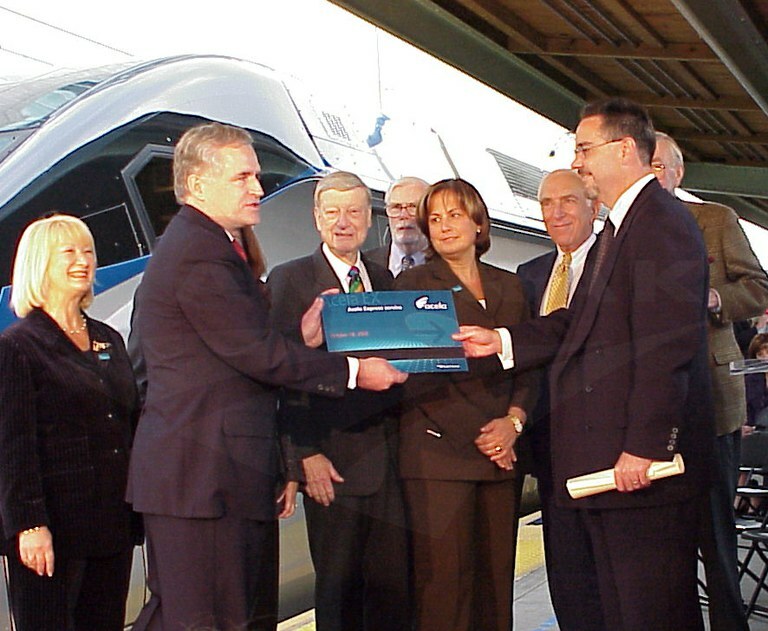 5 “Amtrak announces the start of Acela Express service,” Amtrak Ink, November 2000.